The NV4500 or New Venture Gear 4500 is a heavy-duty, manual shift, five-speed overdrive, longitudinally positioned transmission. New Venture Gear was the somewhat unlikely merging of the two manual shift design & manufacturing divisions of General Motors and Chrysler Corp. The Muncie (or Stewart Muncie) division of GM and the New Process division of Chrysler became New Venture and one of the first fruits of this union was the NV4500. The NV4500 was first released in Chevy / GM trucks from 1992 under GM RPO code MT8 and GM part #12346190. It was introduced into Dodge trucks in 1995. Though it has it roots as the New Process 4500 four-speed beginning as early as 1972 in Dodge trucks, its current incarnation as we know it today is quite different. When the NV4500 was released in the mid-nineties, the 4wd aftermarket and magazines latched on quickly. It was uncritically ballied as the silver bullet and cure-all to any 4wd powertrain problem. Phrases like "Ultimate 4wd Transmission" have been common. Gearing: The NV4500 has an initially attractive overdrive gear, but with a low gear of only 6.34:1 (early units) and a gear span of 7.71 and 5.61:1 (later and most common units) and a gear span of 6.96, its position against the heavy-duty four speeds (SM465, T18, SM420 or NP435) is not a lot better. Choosing the right axle ratio and tire size in conjunction with the right transmission is a smarter strategy than using overdrive as a patch to the system. Size: The length of the transmission, even in its shortest renditions, is too long for many Jeeps, especially those with suspension lifts. The result is u-joint vibration and weakness. The transmission also often requires serious surgery of the body's tunnel to gain back ground clearance. Expense: The initial flurry to get a 4500 drove up salvage prices that have never really ratcheted back down. New units have been available ranging from $2300. - $2600. Parts availability and expense are surprisingly discouraging in addition to frequent year-to-year parts changes. Expense for NVG to build these transmissions is significant. 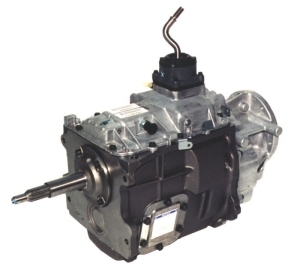 Overdrive adds serious complications to any gearboxes design and manufacturing. Strength: Weaknesses in the transmission mainshaft clutch splines and their mating hubs (usually 4th & 5th gears) from fatigue and wear are prominent. The HD four-speeds exhibit consistently better strength & wear characteristics. Adaptability: Expenses and complications in adapting to either the engine or the transfer case is high. Clutch linkages also prove challenging. There are too many NV4500's in Jeeps due to an artificial push by aftermarket profiteers and hungry magazine writers looking for a quick story. Actual research and critical analysis by the thoughtful Jeep builder will more often yield the conclusion that a heavy-duty, four-speed transmission (if not an automatic) will produce better on-road & off-road results with significantly less expense. The NV 4500 is a top loading five-speed transmission with a cast iron case, aluminum top cover and dual PTO ports. It features all helical gears, and is fully synchronized. The NV4500 has a case length of 12.37". GM 4wd versions featured an extension housing length of 6.5". There are various other Dodge and GM 4wd and 2wd housings. This housing contains fifth gear and as usual, 2wd style housings are longer. A unique feature of the NV4500 is its fly-weighted 1st-to-2nd gear synchro assembly, preventing a downshift at excessive revs. Its unique synchro ring composition requires a special synthetic lubricant. Adaptability to the NP231 transfer case can be acheived when using a Dodge 4wd style tailhousing. However, a change of mainshaft or transfer case input shaft will often be required due to spline count. The NV4500 is found in GMC & Dodge trucks. The bellhousing pattern for 1993-1994 GM versions is unique from the later (1995-) GM and Dodge units. The 1993 and 1994 Chevy versions have a lower first gear of 6.34:1 and an unsynchronized reverse gear. Transmissions after this period have a higher 5.61 low ratio and reverse gear synchronization. The input shaft for the 1992 Dodge NV4500 was 19 splines with a 1" diameter, like its predecessor, the Dodge NP435. All GM units and 1993+ Dodge units have 10 splines with 1-1/8" diameter. GM input shafts protrude their usual 6-5/8" while the Dodge units are 7-5/8" long. 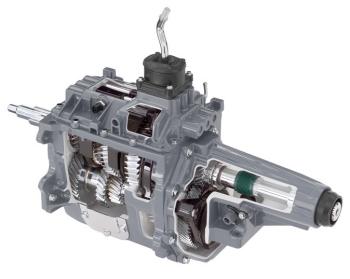 Because of its length, moderate gearing, weight and overdrive, the NV4500 is probably best suited for higher powered Jeeps that require a strong transmission with an overdrive gear. If oversize tires are being used, some Jeeps may never see overdrive and lower axle gearing may be in order to compensate for the NV4500's taller low gear. We are often asked about the durability of the NV4500 vs. the SM420, SM465, T18 and NP435 truck four-speeds. We've spoken with GM and Dodge mechanics that have seen some 4500's come through their facilities for repairs for breakage, but this is most often due to too heavy a truck getting in situations it shouldn't be in. For the purpose of Jeeps, the strength issue is nearly irrelevant due to their agile and lightweight nature.